Dorflinger, Hoare, or Someone Else? Home » Dorflinger, Hoare, or Someone Else? The upper photograph shows part of a group of 19 tableware items purchased by the writer in the spring of 1989 in Delaware County, NY. Measurements are as follows: 6 saucer champagnes: 4.75″H (12.1 cm), rim D = 3.5″ (8.9 cm); 10 champagne tumblers: 4.0″H (10.2 cm), rim D = 2.25″ (5.7 cm); and 3 water tumblers: 4.0″H (10.2 cm), rim D = 3.25″ (8.2 cm). Each glass has a 24-pt star on its foot. The champagne’s stem is solid and is not notched. The six saucer champagnes and the ten champagne tumblers sold for $275 per set in 1989. The three water tumblers sold for $40 each over a period of years. Reflections make it difficult to see the small open diamonds and bordering row of “notched thumbprints” that make up the pattern. These motifs are more clearly seen in the above close-up of a 5″H (12.7 cm) wine glass, red cut-to-clear, that sold at an eBay auction in 2002 for $210 (Image: Internet). The writer also has had an identical red cut-to-clear wine glass in the past; he sold it for $115 in 1989. 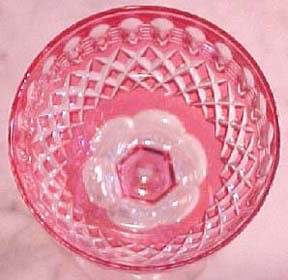 The eBay wine glass was advertised as a Dorflinger product, pattern unidentified, and the seller referred to COLLECTING AMERICAN BRILLIANT CUT GLASS by Bill and Louise Boggess where a duplicate glass is shown on page 78 (color item 46). It is not identified as to manufacturer. Reviewers of this volume (See the boggess.htm file in Part 1) also have not (yet) identified the glass as Dorflinger. The stemware have sets of five shallow notches; the tumblers sets of seven. No acid polish was used. Normally, one looks first to the pattern on an item in order to identify its manufacturer. In this case the pattern matches none that are known, including those found in extant Dorflinger catalogs. But the blanks appear to be Dorflinger’s no. 523, especially noticeable in the saucer champagne glass. The writer has had this no. 523 champagne blank, cut in the company’s Diamond Border pattern. The blanks used for these two champagnes match exactly. Note, however, that the exaggerated distance between the glass’s bowl and faceted knop is not immediately apparent in the relevant DORFLINGER LINE DRAWINGS sketch (p. 145). 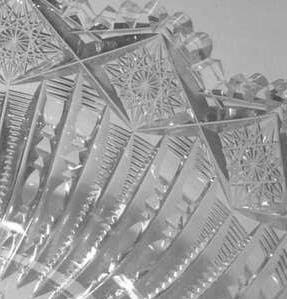 Nevertheless, this characteristic is shown on the champagne glass cut in the Diamond Border pattern that is illustrated on p. 19 of the ACGA composite Dorflinger catalog published by the American Cut Glass Association. The unknown pattern also appears, slightly modified, on the compote pictured below. 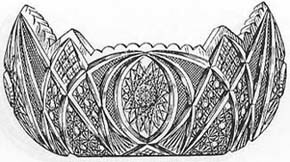 Because of the size of the “notched thumbprints”, the open diamonds would have been too large for the pattern had they not been subdivided as shown. The panelled stem with its faceted knop is hollow. There are sets of seven shallow notches on the bowl. The foot has a 32-pt star. D = 8.25″ (20.9 cm), H = 6.5″ (16.5 cm), wt = 3.5 lb (1.6 kg). Sold for $250 in 1988. Compotes in this style are usually dated c1865-c1880 (Spillman 1989, p. 88), but Feller (1988, p. 28) dates a Dorflinger example as c1890, probably because it is cut in the Parisian pattern (pat’d 1886). Dorflinger called this item a “high compote”. 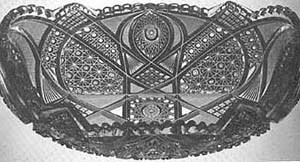 An example, also cut in the Parisian pattern, is shown on p. 80 of the composite Dorflinger catalog. The cutting on the compote, stemware, and tumblers suggests a date of manufacture in the 1870s. The foregoing information indicates that C. Dorflinger & Sons may have been the manufacturer of these items. But, if not Dorflinger, then who? The cutting the shop of John Hoare is one possibility. Some time ago the writer received a single 8.5″ x 11″ sheet that is a photomontage of cut-glass stemware. It was described as a copy of a “miscellaneous sheet” that in in the Rakow Library of the Corning Museum of Glass. In the center of the sheet there are four glasses cut in Hawkes’ pattern No. 3708. Surrounding them are seven goblets and wines. Five of these glasses — two of which are labeled — can be identified as Hoare products, cut in the Souvenir, Monarch, Regal, Croesus, and Russian patterns. Two goblets are unidentifiable, however. One is cut in what appears to be a pattern of overlapping gothic arches, and the other is cut in the pattern illustrated in this file. The word “Hoare” has been written next to this latter goblet, which has sets of seven shallow notches, but the name might refer to the page as a whole (in spite of the examples of the Hawkes pattern), rather than to this particular goblet. This “miscellaneous sheet” is made up of individual photographs clipped from unknown sources and is similar to the well-known bound scrapbooks kept by the Hoare company. These contain patterns from the company’s competitors as well as patterns made by Hoare. 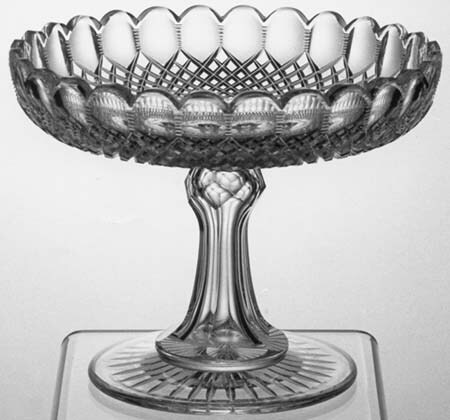 Although the evidence collected to date favors C. Dorflinger & Sons as the manufacturer of this “mystery” pattern, “John Hoare, Rich Cut Glassware” can not be entirely ruled out; neither can other manufacturers of quality American cut glass that was produced during these years, 1870 to 1890. 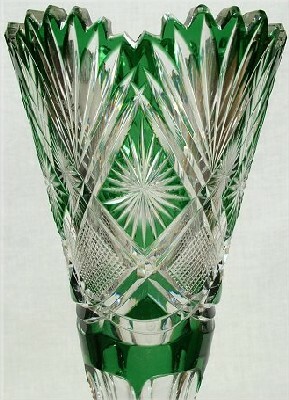 Because the company’s products are universally recognized as being of consistently high quality, there is a high demand for cut glass made during the late nineteenth and early twentieth centuries by C. Dorflinger & Sons of White Mills, PA. With this high demand, and a limited supply, it is not surprising that many items one finds in shops and at auctions are attributed to Dorflinger, often based on little more than wishful thinking. Fortunately, a considerable amount of reliable material for the company has accumulated during recent years, including the standard work on the factory and family by John Quentin Feller (1988), a composite catalog spanning the years c1886 to c1915 assembled by the ACGA (1997), and a collection of blanks (shapes) and patterns called DORFLINGER LINE DRAWINGS (ACGA 1994). Equally important has been the publication of a composite catalog for the Belgium company CRISTALLERIES DU VAL SAINT-LAMBERT (ACGA 1999). 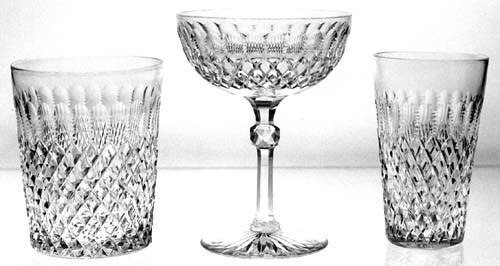 This well-regarded company exported large quantities of glassware to this country early in the twentieth century, much of it similar in style to the cut glass made in this country. This glassware is being re-discovered today. The reader can compare the numerous references to “Val” items among those listed on the correction sheets in The Boggess Project folder. Some of this glass is being re-sold as “Dorflinger”. Welcome to the on-going Faux Dorflinger file! Martha Louise Swan, in her book AMERICAN CUT & ENGRAVED GLASS provides the image, below left, on p. 206. This large bowl, 15″ by 9″ by 7″, is described as “authenticated Dorflinger”, but the reader is not given the basis for this claim. At the time Swan wrote her book the Val St. Lambert catalog, mentioned above, was not available. (More on Val St. Lambert in nos. 3 and 4 below.) Had it been, she would have found her bowl on p. 41 (item 102). The catalog drawing, below right, describes the item as a bowl for nuts, and illustrates both the pattern (3848/17) and the shape (2911/17). In the 1986 printing of the Swan book the “Dorflinger” bowl is given a value-guide price range of $1,200 to $1,450. Somewhat later, Bill and Louise Boggess introduced a near-twin of this bowl, with insignificant differences, as item 819 in IDENTIFYING AMERICAN BRILLIANT CUT GLASS. No manufacturer is suggested, but an American origin is implied. Neither Swan nor the Boggesses mention that this colorless item was also available cased in color, which would significantly increase its value. If this bowl were offered today — and it surely will be — it is likely that it will be offered as having been “made by C. Dorflinger & Sons”. No way! 2. Not the Victor Pattern but a Close Match. 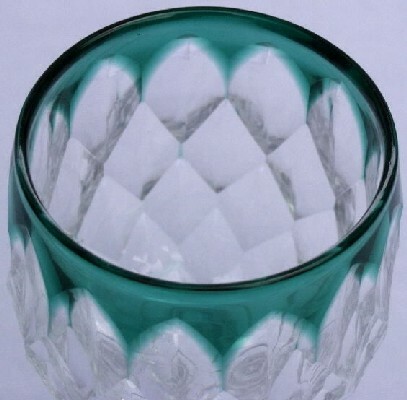 This example of faux Dorflinger is unusual in that the seller, a member of the American Cut Glass Association, has provided all the visual evidence one needs to determine that the bowl offered for sale, on eBay during May 2002, is not — as advertised — cut in Dorflinger’s Victor pattern. The blank, on the other hand, does look like Dorflinger’s shape no. 700 — as claimed by the seller — but, because the company sold blanks to numerous cutting shops this does not necessarily help one to identify the cutting shop that produced the bowl (additional remarks below). Motifs in the faux Dorflinger pattern: chain of Brunswick stars; two styles of Beading (long-short-medium-short-long and short only) not combined with any prism; and Crossed Splits. 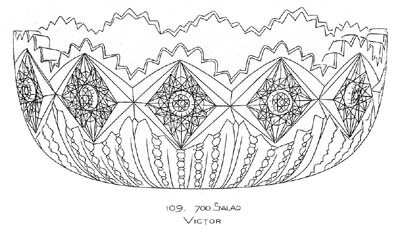 Visual evidence clearly indicates that the bowl is not an example of Dorflinger’s Victor pattern. It is not necessary to belabor the point. But we have solved only one-half of the problem. We would also like to know the correct name of this pattern as well as the name of the cutting shop that produced it. The pattern appears on a shallow bowl (nappy) that is pictured in two of the books written by the Boggesses (with identical photos). In one book the bowl is said to be signed by J. Hoare & Company; in the other book the bowl is said to be unsigned but is identified as a representation of the Haydn pattern by Hoare and is shown in COLLECTING AMERICAN BRILLIANT CUT GLASS as item 546. Unfortunately, this can not be confirmed because there is only one example of the Haydn pattern in the extant Hoare catalogs, and it is a vase. The Hoare company is well-known to have significantly varied its patterns on vertical, compared to horizontal, objects. Several people have, nevertheless, questioned the Haydn identification made by the Boggesses. Consensus indicates that the pattern is not Haydn. A J. Hoare & Company attribution is reasonable, however, based on the style of the the cutting and the disappearing signature (an inconsistency typical of the Boggesses). In addition, the company is known to have obtained some of its blanks from C. Dorflinger & Sons. Prospective buyers may have recognized the faux Dorflinger nature of the bowl because it was “bought-in” for $263.99 at the eBay auction. “Made by C. Dorflinger & Sons?” Yes, but only one-half of the item — the blank. It is safe to say that most buyers, here and elsewhere, would consider a cut-glass item’s pattern more important than the shape of almost any bowl offered for sale. Few of us collect no. 700s! 3. Motifs: Double Mitering, Fans, Single Stars, and Strawberry (Fine) Diamonds. The “Dorflinger” pattern below appears on the market with some regularity. It can be found in colorless glass, but is especially attractive, and expensive, in this green-cut-to-clear version (Images: Internet). It is also, but more rarely, found in red-cut-to-clear. The Boggesses, in their books, consistently describe the pattern as having a Dorflinger origin: see item 519 in IDENTIFYING AMERICAN BRILLIANT CUT GLASS and item color 53 in COLLECTING AMERICAN BRILLIANT CUT GLASS. These references probably account for much of the misinformation about this pattern that has become so wide-spread today. Encouragingly, however, at least one auction house that previously labeled such items as Dorflinger has ceased to do so. The following vase was offered for sale with the notation: “We feel it was made by Dorflinger, but it could also be Boston Sandwich.” H = 14.25″ (36.2 cm), foot D = 5.5″ (14.0 cm). The vase failed to sell at its starting bid of $1,195 at an eBay auction in 2004. The vase was actually made by the Belgian glass factory CRISTALLERIES DU VAL SAINT-LAMBERT and imported. The pattern is identified as 1338/7920 and the shape, shown above in two views, 2982/17. The drawing on the left is taken from the 1908 Val catalog and shows the pattern on shape 2977/17. It must be emphasized that no such Dorflinger pattern has been discovered in spite of the considerable amount of authentic material — catalogs, line drawings, and advertisements — that has become available during the past few years. The 1908 Val catalog is available from the ACGA in an edition that includes catalogs from the years 1904, 1906, and 1908. When a 22″ tall specimen of this vase (pattern 1338/7920 on shape 2982/17) was placed in auction late in 2001, it was described by the seller, a ACGA dealer-member as “definitely Dorflinger”, and the Boggess references were cited. 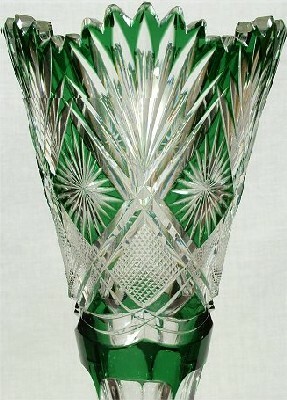 The vase, in colorless glass, sold for $2,550. A popular, quality item, yes, but made by C. Dorflinger & Sons? No! Another popular pattern made at the Val St. Lambert factory and frequently attributed to Dorflinger is the company’s Florian pattern. It was available in both colorless and colored glass. The drawing on the right shows this pattern on shape 3506/17 as depicted in a Val catalog dated 1905. As early as c1890 C. Dorflinger & Sons was cutting an identical pattern which the company called Renaissance, while at the same time the Mt. Washington Glass Company also had a matching pattern in its catalog named No. 33. Over the years additional companies cut this popular pattern. As a result, today one must identify the shape that accompanies the pattern in order to arrive at a reasonable attribution. The pattern is so popular that, when the manufacturer can not be identified, the name Renaissance is used generically. Fortunately, the 1905 Val catalog is available from the ACGA. Word of this has not, however, reached all sellers of cut glass, including the individual who placed the following set of six green-cut-to-clear wine glasses on eBay and advertised them as “Renaissance by Dorflinger”. There is no record of this shape and stem cutting in the Dorflinger archive. The glasses match the Val catalog drawing, above, exactly (item no. 210 on p. 155 of the ACGA reprint). 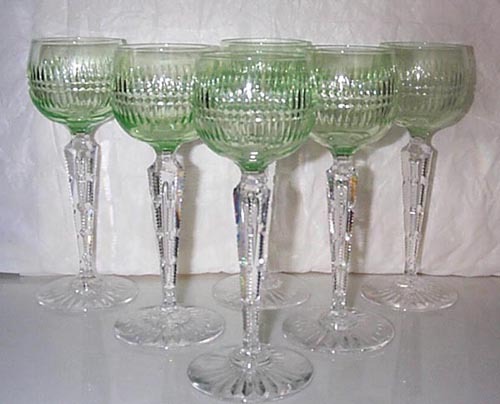 The six glasses failed to sell at an eBay auction in June 2002. It was “bought-in” at $440.98 (Image: Internet). 5. And Baccarat Too Is Sometimes Presented As Dorflinger. The writer once had a colorless wine glass that was a slightly smaller version of the turquoise-cut-to-clear example in this section. The colored wine was offered for sale on eBay as “a slight variation of the Honeycomb pattern by C. Dorflinger & Sons, of New York….” Both glasses were actually made by CRISTALLERIES DE BACCARAT as part of its Juvisy service. (The name refers to the pattern/shape combination.) A decanter and glass in this service is pictured in Curtis’s book on the company (Curtis 1992, page number not available). 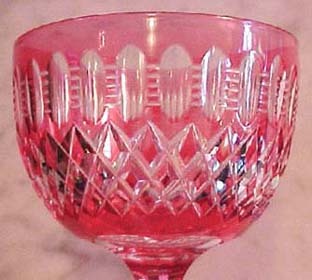 The Baccarat wine glass was offered by two long-time (35 years) member-dealers of the American Cut Glass Association. Two views of a wine glass, turquoise-cut-to-clear by Baccarat but advertised as Dorflinger. Solid, paneled stem with faceted knops at each end. 16-pt star on foot. Late nineteenth or early twentieth century. H = 5″ (12.7 cm), rim D = 2.25″ (5.7 cm). Sold for $325 at an eBay auction in 2004 (Images: Internet). The close-up image shows hollow figures that are barely six-sided. One is uncertain whether to call them hollow hexagons or hollow diamonds. 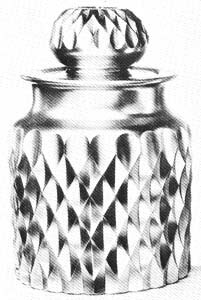 In any case this Baccarat pattern is far removed from Dorflinger’s Honeycomb which is composed of split hollow diamonds, as shown below on the left on a cigar jar from the Wetton portfolio catalog (Feller 1988, p. 322). The Baccarat cutting more closely resembles Dorflinger’s Hollow Diamond pattern, below on the right, which has hollow hexagons. This image has been taken from DORFLINGER LINE DRAWINGS (1994, p. 36). The pattern name Honeycomb is sometimes used generically, in place of Hollow Diamond, when the manufacturer is unknown. However, if the maker is known and is, as in this case, Dorflinger, then Hollow Diamond must be used. 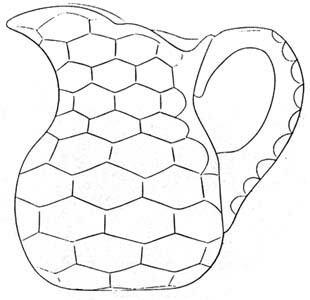 Dorflinger restricted the use of the pattern name Honeycomb to the pattern illustrated above, on the left.